Some of our Fine Art Bartending graduates of the Bartender Certification Course have gone on to some amazing careers. Over 35 years of teaching how to bartend does result in some pretty amazing bartenders that have gone on to dazzle the world. Read even just a few of these awesome testimonials of past students. At one point, they didn’t know the difference between a lager and an ale either and also wondered how to become a bartender! Luca Corradini attended Vancouver’s Fine Art Bartending School in 2008. Since then he has gone on to incredible international success as a Bartender. After finishing up with the Fine Art Commercial Bartending Course, Luca found himself an entry level bartending job on Granville street at Cafe Crepe, slinging pitchers of draft for students. From these humble beginnings, he went on to London, England, and became immersed in the local flair bartending scene, entering international competitions and working at a London Nightclub. From London, he travelled to Mexico, teaching flair bartending seminars of his own as he traveled across the country. Back in London, and working at another hotspot, Luca’s flair bartending skills were spotted by a recruiter for a huge hotel chain, and he was offered a job in Dubai. After a stint bartending at the massive Jumeriah Beach Resort in Dubai, Luca headed back to London once again, and became immersed in craft cocktail culture. Luca now works behind the bar at one of the most historic, top cocktail bars in the world. Luca regularly travels to train bartenders and do guest bartending appearances in cities all over the globe. We are incredibly proud of what he has achieved over the last 7 years, and we appreciate his public endorsement of the training he started with at Fine Art Vancouver. I’d been working at a banquet hall, for about two years, before I went to Fine Art. I wanted to become a bartender. There was this lounge attached to the hall that I really wanted to bartend in. My boss wouldn’t promote me because he didn’t feel I was qualified to make the cocktails there. At Fine Art I learned a whole load of classic cocktails, and got a ton of time to practice. When I graduated I felt really comfortable being behind the bar and I even got to bartend at a couple of events after graduating. My boss took me a lot more seriously after all that, and started giving me those shifts in the lounge. “It was great in the lounge, and I did that for a while, but what I really wanted to do was get downtown, like into the club scene. I took the course in Vancouver to prepare for a job I had already set up at a restaurant in the Caribbean. I was nervous that my manager & customers would be able to tell I was new, but coming out of the course I had lots of technique. To become a bartender you need to know how to pour properly, and have an idea of quantity. Having some conversation starters with my customers, how to make different drinks, and a better education on different spirits, liqueurs, beers and wines. What I can really say about taking the course is it gave me a little more confidence and although I still had a lot to learn I felt like I wasn’t starting at zero, I had a base. My first job was working at a Tex-Mex bar and grill called Jimbo’s Rock n’ Blues Cafe. Famous for it’s Margaritas (thank God you taught me those!). Then a small beach shack which was really cool just working barefoot in the sand wearing a bathing suit. That was a cool experience I hope many bartenders get to experience at some point. The last place I worked at was a world renowned restraint called Sunset Bar and Grill (used to be Sunset Beach Bar but switched ownership) and it’s located at the bottom of the airport’s runway in Saint Maarten. Thanks Fine Art Bartending for giving me a kick start to my Caribbean bartending career! I took my class at Fine Art last summer and a month later I was hired as a part time bartender at Vancouver Harbour Cruises. Its a cool job with great money. The class was fun and very practical. I learned all the essential skills during class. Thanks for helping me being very “Cool” in front of my friends and fellow classmates. Awesome experience. All the best to Fine Art. Taking the Fine Art Bartending course in Vancouver was one of the best choices I ever made. The intense 2 week course opened up the doors to options, cash flow, and travel around the world. With my persistence and the assistance of Fine Art, I landed my first bartending gig at a restaurant in Richmond. From there I worked at a handful of pubs, nightclubs, and restaurants in Vancouver where I had the potential to make as much as $1000 in a single night! Not only did I get the confidence and knowledge to become a working bartender, I also took the flair bartending course and eventually participated in 2 exciting competitions at the Mirage Nightclub and The Plaza over the next couple years. This gave me exposure to the industry and an ability to market myself to potential venues. My experience as a bartender landed me a job with the bar staff on the most famous luxury cruise liners in the world: Cunard. I have traveled to all of the continents in the world, seen the pyramids, the Eiffel tower, Coliseum in Rome, Fjords in Norway, Berlin wall, penguins in Chile, crocodiles in Costa Rica, (you get the point!) and more! I am currently work at ‘The Cluricaune’ pub in Winnipeg while I finish off Broadcasting school. My passion has always been to create smiles. Knowledge, speed and efficiency are key, but having a passion for people and the ability to entertain will make you an exceptional bartender. Fine Art will definitely give you the tools and the rest is up to you! I took the day class at the Fine Art Bartending school in Vancouver back in summer 2008 and I have to say it was a real awesome experience. The instructor was friendly, and not to mention the course was creative and fun! You will learn the real stuff by practising every class, as the result, you will become a bartender just as you dreamed to be! I got two part-time jobs right after my graduation and I find what I learned from school helped me a great deal at work. Many thanks to the Fine Art Bartending! The Fine Art Bartending Course was not only an absolute blast but also very informative. I took the day time course in December. The course was practical and to the point. I feel that I have taken a lot away that would have taken much longer then if it had been through trial and error. I have found the job market is still fairly experience focused. However, with the bartending course under my belt, I have found myself a position serving at an upscale Mediterranean lounge in New Westminster. I plan to return in the future for the one day flair course. I have been interested in bartending since I turned 18 (in Alberta that was considered legal) but I never knew where to start or even how to become a bartender. No one would hire me because I had no experience. This is where Fine Art has really helped me along. By having the certification I have been hired on as a bartender for events and a production company’s theatre. This job would not have been obtainable without the certificate due to its fast pace environment and high class clientele with all their high expectations and need for the more exotic, delicate, and plainly more difficult drinks. 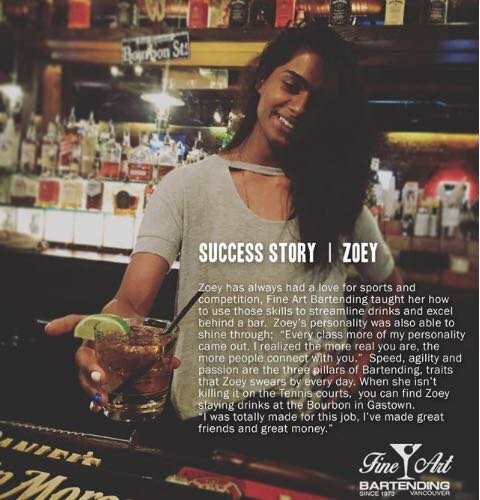 Thank you Fine Art for helping me break in to the industry and teach me what it takes to be a successful bartender, I wouldn’t have been able to do it without you! Thanks to Fine Art Bartending School, you guys showed me and taught me what I needed to know to work my magic and become a bartender. The school even got me my very first job at a catering hall in Vancouver, and private gigs which i still do now. With their experiences and knowledge they can answer any question, and they’ll also teach you how to throw bottles in the air. I even referred 3 friends and they all loved the school and continue to send referrals. And the best part i can come back anytime for a quick refresher on new drink recipes, tricks and tips. cheers to the very best bartending school there is! My English wasn’t really good when I took the class but you found the way to explain it to me properly, so I could become a good bartender! I was already working as a bartender in a restaurant in Vancouver before I took your course, and a month after taking the course I became the bar manager! During the time that I was a bar manager I developed and created an entire drink menu – taking your course was a essential step to get to this point ! Thanks a lot for bringing me there! Even though I don’t speak English fluently since I’m from Sweden, I think Fine Art Bartending School was really great! I stayed in Vancouver for a couple of months and just before I left I decided to take the course and I don’t regret it for a second. The teachers are great! They don’t just teach you some drinks; they really prepare you for the actual work. I would really recommend Fine Art Bartending School to anyone! Cheers! I took the Fine Art Bartending course a while back, but as a SECOND bartending course. I would have to say that I learned so much more in this course. Anyone can pour an ounce into a shot glass but this course teaches you the KNOWLEDGE you need as a bartender. I have ended up bartending in a number of environments from busy Granville street nightclubs, to high end restaurants, to country clubs. 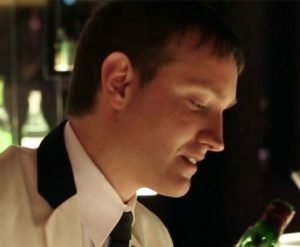 This course teaches you how to be a “diverse” bartender which lead to my success in the industry. Before taking the course, I would always have to have a bartender, working even on slow nights. Now, I can run the show with no help (Less employee cost). I always scheduled one extra server in case we get busy. But now if we get rush I go to the bar, make the drinks for the server, and everything runs smoothly. Learned how to setup the bar properly and efficiently. During the course I became familiar with all of the popular drink names & terminology. Now at least I do not look confused when I get the orders, as we have guests from many different countries. After the course (and some self study), I made my own recipe for a new martini, we sell that more than our 9 other martinis. The course did a help in a few other areas such as Inventory etc. I enjoyed the course a lot and I’d like to thank Fine Art for what I learned. I just wanted to say thanks to both you and Suzanne! You offer an amazing program and both of you were so personable. It was a pleasure to learn how to become a bartender from you. Suzanne’s knowledge was amazing…anything we asked her in class, she was able to answer. I am still working in the same pub as before, but I now do some bartending as well. Quite frankly, I’m not sure why I didn’t take this program before! I look forward to taking your flair course sometime in the near future and expanding my repertoire. I have recommended this school to anyone who is interested in learning to bartend. Thank you again! I had so much fun!! Enrolling in the Fine Art program not only gave me solid fundamental bartending skills but engaged my interest in the industry. The school’s flexible hours allowed me to complete the 2 week course while working a 30-35 hr/week job. After finishing I found a better job with possibilities for promotion in a great organization in Yaletown. My success there can almost certainly be attributed to the professional attitude and habits encouraged in the Fine Art program. I even scored the top prize in a monthly martini competition with what I learned. I had a lot of fun in the course. Learning the drinks was fun but I think what made it was the people I was in class with. A class full of outgoing people just makes it that much better. I did manage to get a few bartending gigs in the summer doing weddings and beer gardens through the schools contacts in North Vancouver. Overall, the course was well worth it! Wanting to become a bartender and going to Fine Art Bartending School was the best decision I made. I took the night course and everyone that attended the class with me at the time, was so nice and helpful, and the teachers were great. Having a background of liquor and bartending was a lot of help when it came time to look for employment. I have now found full-time work bartending at a busy bar in Burnaby. Having the Fine Art Bartending course under my belt REALLY made finding a job faster, and easier. It was awesome being at my first bartending job only 8 days after finishing the course and when I stepped into the bar for the first time it felt like second nature. I was confident making drinks, thanks to the great teachers at Fine Art. I found that I had a real passion for bartending, and learned every drink that you can think of. It was really fun and rewarding being able to make the drinks, and see how quick I could make them. With the help of my amazing teacher, I was given the confidence and skills to work right away. Only a few weeks after completing the course, I started working at Pop Opera, one of the hottest and busiest clubs in Vancouver. Not to mention I was bartending at a bar, all by myself, and loved it. I’ve worked there from the grand opening, and still love my job. Without the confidence that Fine Art Bartending has given me, I would not have become a bartender. The confidence and knowledge to work in a busy club came easy. I wanted to take the time to say thank you for the great time I had at Fine Art Bartending. I have never been one to do well in a class room environment, but this was different. Your extensive knowledge and ability to connect with your students made it possible for me to understand and put to practice all that was being taught. The course was not just knowledgeable but was fun as well. The hands on exercises were pretty intense at times but gave you the feeling of working in a busy bar. Being someone that has worked in the bar industry for many years I can honestly say I have seen a lot of bartenders come and go. Those bartenders that lasted the longest, made the most tips and were the most knowledgeable were your graduates. Keep up all the great work! ​The Fine Art Bartending classes were a great help. I took day classes and had just finished with my previous job, learning to bartend was a great experience. It opened up a lot of doors for me, especially when employers found out what course I took. The course is awesome you learn amazing drinks and the students and instructor made the class enjoyable. I’m presented with new opportunities everyday and the instructors even helped me to start earning the big tips. Thanks! Join us anytime for our comprehensive 32-hour bartender certification program. Over the course of a couple of weeks we will teach you how to become a bartender. We list off a pile of reasons why Fine Art Bartending is Vancouver’s Best Bartending School, but it is only through asking past students that you really learn why. If just don’t know who to ask, reviews like those above are a start!